You’re serious about gaining strength, burning fat, and increasing overall athletic performance – that’s why you train hard! The key to maximizing the benefits of any movement that includes a squat is proper form and depth. Not executing correctly can work the wrong muscles and cause unnecessary stress on the body. squatLIFTS provide a cost-effective way for athletes of all ability levels to improve mechanics. The innovative shoe inserts add the heel height typically only found in Olympic weightlifting shoes to your daily training shoes. Simply slip them in for improved performance when a workout contains a squat movement or Olympic lift. You will squat deeper, maintain a more upright posture, and drive more power through the heels. squatLIFTS are also designed to allow athletes to easily transition to the forefoot and stay explosive for all types of athletic movements. This makes them perfect for the pairing of strength training and conditioning movements found in functional fitness methodologies. squatLIFTS are guaranteed to make it easier to maintain proper form while you complete strength training and conditioning workouts. Try them for 30 days, and if you do not agree, we’ll pay domestic return shipping and provide a full refund. © 2013-2017 wodLIFTS, LLC All Rights Reserved. wodLIFTS is a Trademark of wodLIFTS, LLC. squatLIFTS is a pending trademark of wodLIFTS, LLC. Athletes encounter a variety of unique challenges when completing the varied movements associated with intense functional fitness training. One that many athletes struggle with is deciding which shoe to wear when workouts include both squats and agility movements. A great example is “Nancy” – 5 Rounds of 400 meter run + 15 Overhead Squats. Most of us would appreciate the raised heel of a weightlifting shoe for the squats, but they are too heavy and rigid for a series of 400 meter runs. wodLIFTS addresses this problem by allowing athletes to add heel height to a flat training shoe that is light and transitions easily to the forefoot. Adding heel height to a shoe that is not heavy and rigid allows athletes to squat deeper without limiting the ability to complete athletic movements that require running and jumping. They are built of a solid material that does not compress. Putting them in your favorite metcon shoe provides a stable base during any WOD that includes squat and agility movements. Each year the programming competitors face at every level becomes more complex and physically demanding. You will be hard pressed to find a competition that does not present at least one event that leaves athletes making compromises when choosing between weightlifting shoes and a favorite flat metcon shoe. Minor improvements during pistols, wall balls, or any other squat based movements can add up over the course of an event. Not everyone faces the same limitations, but everyone has a movement where wodLIFTS will provide an edge that could be the difference between the podium and disappointment. One major benefit of weightlifting shoes is a raised heel, which provides a mechanical advantage when athletes execute squat movements. The additional height helps to overcome range of motion limitations that can be associated with tight ankles, long femurs, or other anatomic issues that make it more difficult for an individual to achieve full squat depth while maintaining an upright torso position. That is the long way of saying they make it easier to squat deep. While many athletes do find achieving an appropriate squat depth to be difficult, not every athlete wants or needs to invest in lifting shoes. 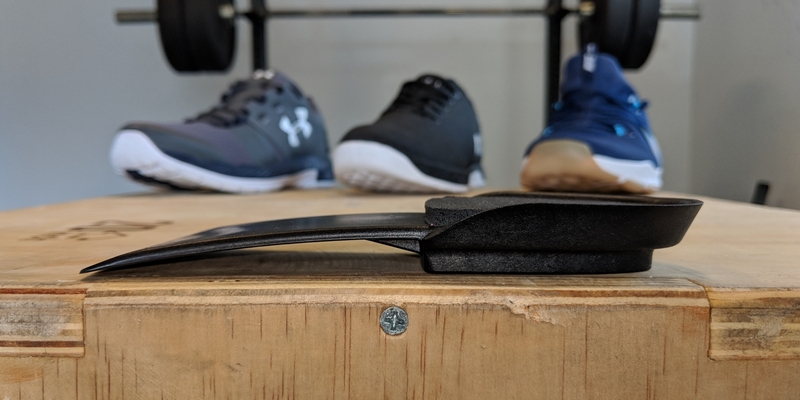 Adding a pair of wodLIFTS to your favorite pair of functional fitness appropriate shoes provides an inexpensive solution that provides immediate performance gains for strength training and metcon workouts.